The Jibbitz website / blog has announced today that they have agreed to be purchased by Crocs, Inc. the people who make Crocs shoes. 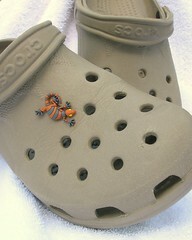 Jibbitz has been a family owned business that makes very clever decorations for Crocs. 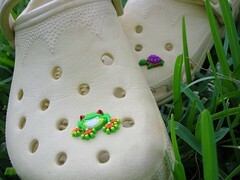 The Jibbitz gadgets slip through the holes and allow Crocs wearers (already an incredibly hip lot) to further customize their shoes. I hadn't heard of Jibbitz until a few weeks ago when my sister sent me a few and I applied them to my Crocs as well as those of my bride. I previously used size and color to tell our Crocs apart, but now I can take a quick look at the cute critters perched atop them as well. The Jibbitz are very cool and they have an incredible assortment of them. The reason I celebrate them here is that it would appear from their website and blog that a husband and wife, with the support of family and friends have built a successful business and managed to sell it within just a few years. They say that they currently have over 300 styles of Jibbitz and sell to over 4000 dealers in the US and Europe. Their product is definitely fun to use and I imagine that they have had a fun ride while building their company. It's on my to do list to give them a call and see if we can't have a chat with them about the business of building their business. Best of luck to them. The press release says there is another $10 million in their doing well in the years to come.